Thought the dress was nothing to write home about. Didn't seem to fit well at all. Wasn't impressed with the daytime outfit either. Debie, you are always griping! fit for the queen. In this occasion, she is angel. It is a beautiful dress and very becoming. Congrats to Jason Wu! Thanks to the first lady for putting the emphasis on small business, and the military families. Doubtful to short.... I guess you mean like Taylor Swift , Dolly Parton, Reba McEntire, Cher, and half the men in Hollywood? No stupid i was talking about her wig, you dense ??? I have to be honest, I think her old hair was nicer. I don't know, she just doesn't strike me as a bang person. Yep, I am not a fan of the bangs. What do you want to bet you will see bangs on all the models on the spring runway fashion! Thank heavens she didn't go with the outdated too many extensions total mess looks of Parton and McEntire! It's a great haircut to hide those pesky plastic surgery scars while they heal. the scowling first black lady who sometimes dresses like a lady of the night...not impressed. You, sir, are an azz!!! I see where what you spend most of your low racist cop pay on. Jerry, you sound jealous. She must wear the dress better than you do. Baggers are never satisfied, never have a life of their own so they whine and criticize people who do. Classy, beautiful lady in a classy, beautiful dress. Hey Jerry, try a different size, it just might fit. Looking in the mirror, way to descibe yourself !!! I'm sure your looking in an honesty mirror would break the looking glass...it would certainly detect your evil heart. Your nasty, racist words speak for themselves. You are a racist and a pathetic excuse for a human being. I need no mirror to see and understand that. I described you, which was an easy thing to do since you racist read like first grade "I am a silly idiot" primers. Easy to read and understand. well, put lipstick on a pig and you still have a pig. Mz obama is s south chicago racist and leftist radical, hard to wash that off. I said she is black and that statement makes me a racist...it don't think so. Those of you who believe calling a black person black makes one a racist need an education and/or debriefing. when a pig denies what they are (racist) than it becomes time for them to become ham! It is not what you said, racist, it how you said it. You racist folks make your ignorant racist statements and then you think no ones see or heard your dog whistle. Idiots. It is you who need the education in how to be a human, because right now you are surely lacking. I'm with you Jerry, a white person refers to a black person we are racist, blacks call us whiteys and it's ok......personally, I think the first lady has been a disgrace for America. We have had some first class first lady's and she isn NOT one of them, nor is he a president. Call it what you want...there is still a first amendment, although he is trying very hard to take that away as well. I believe in the words of Dr Ben Carson, I'm a whitey, and I'd vote for that man in a heartbeat. @Jean ooooh ouch what pain you you have caused me-- NOT !!!!!!!!!!!!! anything is better than the first dress she had on...it looked like drapes and the color was horrible. whew! The dress is beautiful and she was smokin!!!! President Obama was looking pretty fine himself!!! Look at that First Couple! America's finest! I just adore them! Oh, the dress... BEAUTIFUL! I don't care what anyone else wears. Surely no one cares what I wear. The last dress receiving this much attention had a stain on it & belonged to Monica Lewinsky. Michelle Obama’s Thom Browne Inaugural dress came in at an estimated $10,000 (black). 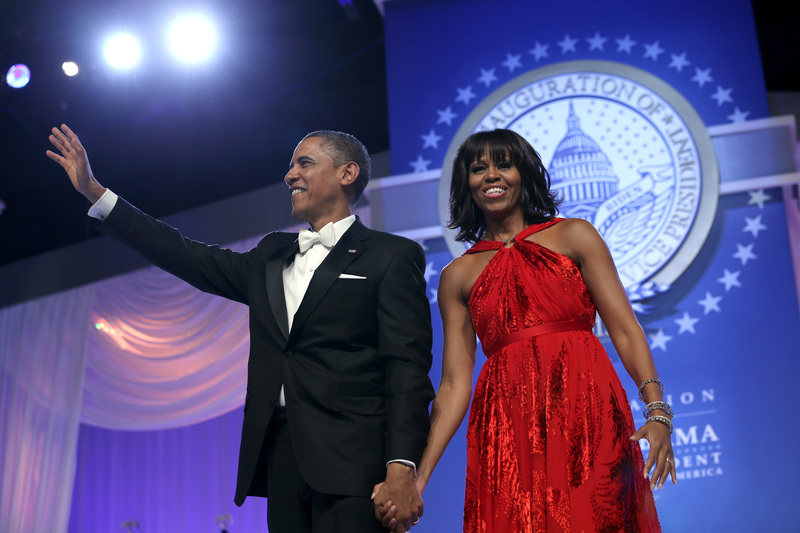 Michelle Obama’s dress for the Inaugural Ball by Jason Wu cost an estimated $5,000 (red). Meanwhile, in the real world, incomes are dropping. In 2011 the annual median income was $26,364 in America. Michelle spent more than half of the median salary on her dresses alone. This is not even including the hair stylists, make up artists, shoes, etc. The red dress can't hide Michelle's flat chest and WIDE hips. That haircut is right out of the ho style of Harlem. Is this really what the American people care about??. Pretty is as pretty does !! don't you feel safe knowing jerry the cop is protecting you.? He is a real PIG gosh should have known. As for the first lady she looked nice. Cheap shots at her appearance are exactly what we have all come to expect from the right. How sad. You either liked or did not like the dress period. Remarks about her body and looks are really stupid. She is brighter than most posting. nice... 47 million on food stamps... 8% unemployed.. and she had the GAL to wear this milion dollar rag? it is truly all about the dress. SHe is average at best.